Batch processing is the ability to process more than one file in a straightforward and easy way. To understand the concept it can be helpful to visualize an issue that might arise when dealing with a large amount of PDF documents. Imagine you have hundreds of PDF’s that require the same or similar changes that need to be made in order to bring them into line with a new policy. An old way that you would have done this is by manually opening each document and making the individual change and then saving them. Automation or batch processing allows for a logic sequence to be run by a program like Debenu PDF Tools Pro that can perform the required changes the same way, over and over again. 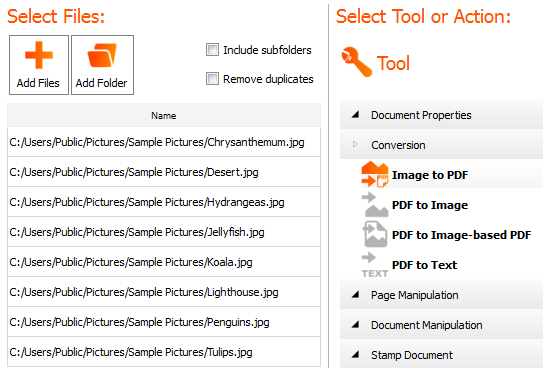 Tools ‘watches’ a folder and when a new document of the correct format enters that folder Tools gets to work. It performs the specific, pre-determined set of actions to that file and makes the end result available to you. Computer automation, and batch processing can save days, weeks or months in tedious and laborious work.